A wonderful condo! Well appointed, clean and well maintained. Could not ask for anything more!! We had an issue with the router (no wifi) but it only took one call and the problem was fixed. Across the highway is Safeway & Foodland. A Ross dress for less is also due to open. Additionally, there are a few good eating spots in the strip mall, though we recommend you eat in rather than take-out! If you are looking for a relaxing, stres free holiday, then start right here. Ideal location with beautiful views and great pool. Clean, well-maintained home with everything we needed. We’ll be back. My family and I absolutely love Waipouli Resort. We felt welcome and very much at home in our condo. It seems to be in the heart of the island making access to all the sites and activities so easy. We especially enjoyed the Kauai photography hiking tour and the Kipu Ranch 4 wheel adventure. At the resort we saw whales and seals, as well as breathtaking sunrises each morning. No one could ask for more. When we did have a problem with the unit, it was fixed quickly and professionally. This is my second stay here and I will continue to recommend this property to my friends. Much mahalo to you all!! Once again, absolutely fabulous! We've been coming to Kauai for years with extended family. We discovered Waipouli Beach Resort a few years back and have stayed here ever since. 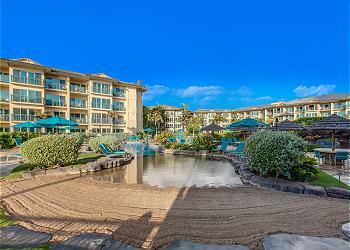 We absolutely love staying at Waipouli Beach Resort in the King Waipouli. It is located on the Eastern side of the island in Kapaa. This is a prime location of the island with convenient shopping and amenities within walking distance and numerous restaurants within walking and driving distance. The location allows for easy travel North or South for island exploring in Poipu, Princeville and Hanalei. King Waipouli is well maintained and in great condition. The management company is the best. If there is something wrong or in need of repair they are quick to repair it. Absolutely, the best customer service! Love it so much we are looking forward to next years trip already!! We had a fabulous time. While this condo is the dream of Hawaii condos we don't want to tell folks about it so that it is sure to be there for us when we come back. Location was great, everything was clean, all the item we needed in the kitchen and a view to die for. We spent days at the pool and made a trip to the spa. It was a great week. This was by far probably one of the best vacation units we have ever rented! Especially spacious for 2 couples, great kitchen, really nice furnishings, fantastic sunrises every morning, right on top of the water, and 100' from a fabulous restaurant and pool area. It's also convenient to shops, groceries, restaurants and a long oceanfront bike and running trail. We truly had a fantastic week here! We rented two condos next to one another for 5 days this past December. The condos were beautiful. Very spacious, clean, full kitchen, excellent views of the ocean. The pool was wonderful and there was a small beach space right by our condos. This was a great place to stay with a large family! 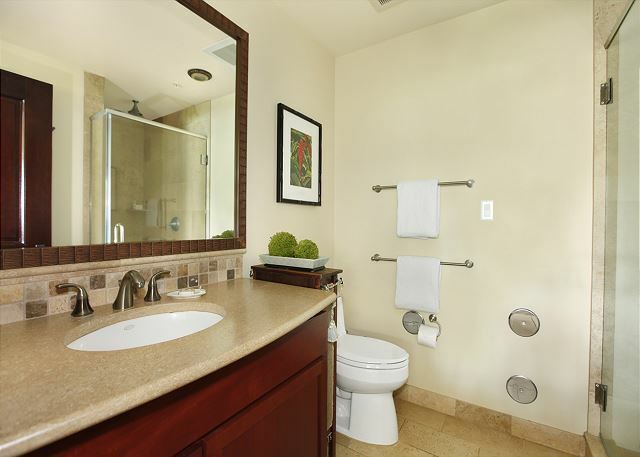 The location of this condo is the best on the property, it was spacious and had everything we needed. We would not consider staying anywhere else when we come back to the island. 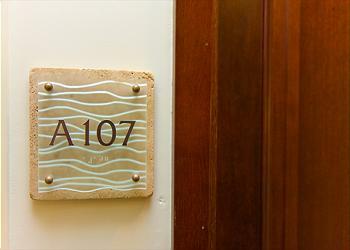 We returned from our stay in A107 at Waipouli with more than enough great memories to last us until the next visit. We've stayed at this resort many times before, but this was the best experience we have had. A107 has the perfect combination of privacy, scenery, and luxury. It is a beautiful spot, and we cannot wait to return! This beautiful unit continues to be like a home away from home...but in paradise. 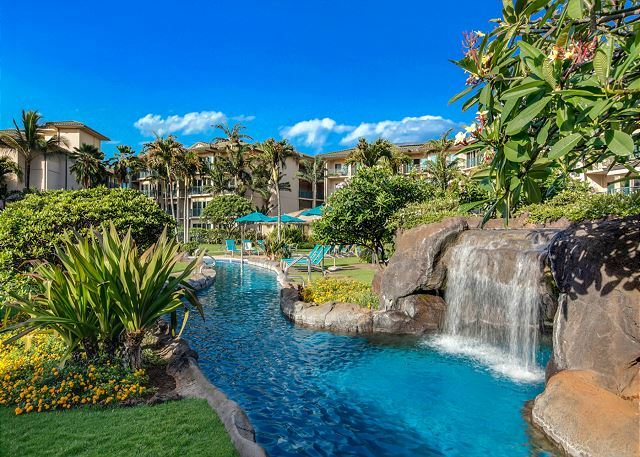 Kauai Exclusive Management has our highest praise for professionally supporting our every need while welcoming us to the island with the Aloha spirit. The unit is in beautiful condition and decorated by an owner who clearly loves the condo. We will continue to come back to the island, Waipouli Beach Resort and this unit every year and feel like we are coming home. Great location. Nicely furnished unit. It's very comfortable and is right on the Ocean. But, I own rental properties myself. I have been an investment Real Estate Broker. The unit needs electrical work. You already know that, but, nobody is servicing the unit. Breakers, GFI's, or, something else have gone wrong in the baths. Hairdryer will not work in either bathroom outlet. You mst stand in another area near a different wall socket. I reported this on Day One. I was thanked and assured that someone would come the next day to fix it. NOBODY ever came during our four days. A clear indication to me that the problem is known and just being ignored by the property management team. I reported the broken lamp on the bureau in the MBR as well. Unit needs more than one dish towel. Suggest you add a few feather pillows in the unit. Dacron and Rubber are NOT luxurious like the bed and bedding. Suggest you calibrate the thermostat and consider dampers in bedroom one to allow the AC to balance out throughout the unit. Today, about 2/3 of the forced air goes directly into Bedroom 1 due to proximity to the AC unit. So that room is like a fridge. The condo was much more than we expected. It was very comfortable and had everything we needed for our stay. The view was spectacular and the yard was great for the kids. Would highly recommend staying here, just wish we could have stayed longer. We had a lovely time in Kauai as always. First time at this property and loved every minute of it. I couldn't have asked for a better family vacation. Loved it so much we booked the same unit for next Spring Break. Looking forward to it! Mahalo! Had a wonderful trip, awesome rooming and accommodations. Beautiful views, very quiet.Would stay here again. We stayed December 7-17, 2015 and we couldn't have been more happy with everything this room and resort had to offer!! The side yard is perfect for little ones who want to run around and play outside and the inside of this condo truly is fit for a king!! Everything on the inside was perfect and homey and the pool was perfect for little ones! This is our fourth summer in Kauai - we have had the pleasure of renting from Kauai Exclusives each year and stayed in a couple different units. This one is far and away the best. It has the best view and access to the beach in the resort and has been decorated the way you would expect someone to decorate a treasured family home. It doesn't feel like a vacation rental at all. We have a special needs child and the unit was very accessible. The management team is so professional and went far and above what we expected. We have rented this unit again already for next summer. This was the perfect way to celebrate our anniversary. The condo was just as pictured and met all our needs. We had one of our daughters and her family in the condo with us and the other daughter and family in another unit. We were all very comfortable and had plenty of space. The location was very convenient. We walked to stores and had easy drives to activities all over the island. The beach and pool were wonderful. If we make it to our 60th anniversary, we will be back. Very little closet space. In fact master closet could not be opened because owners took half with their possessions which blocked door from opening. Only viable space was in guest room. This place was better than i was expecting. We will be staying here the next time we are an Kauai. 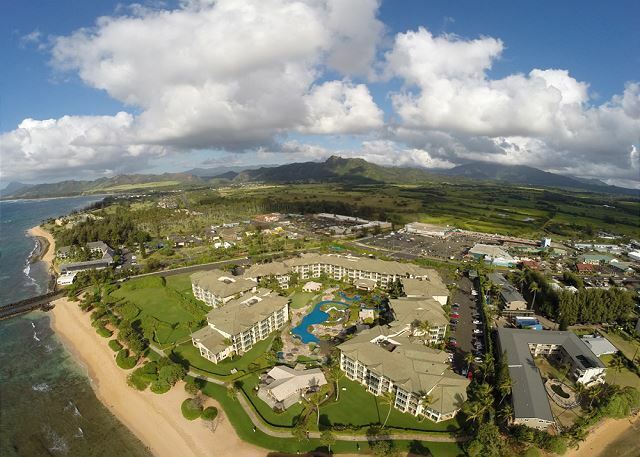 Fantastic stay in A107 through Kauai Exclusive! This property was superb! We started and ended our day on the large ground level lanai which provided an awesome view of the ocean....coffee in the morning and cocktails in the evening listening to the waves.. 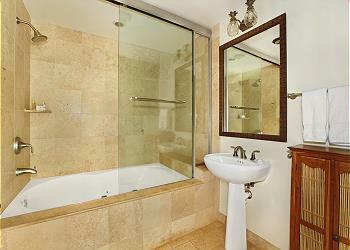 The condo was very well equipped and we loved its openness and the expanse of the bedrooms. I highly recommend this property! This unit is the most private on the complex and offers you a large outdoor patio and grass area for your own use, it would be perfect for small children to play. The unit is well equipped, everything we needed was there. It's central location on the island was also key to easy access to restaurants, groceries and events. The professional and responsive service of Kauai Exclusive was impressive as well as the events Sonia recommended. We will definitely stay here again, it was the most comfortable vacation stay I've ever had. Great experience! The room was perfect, the green space beside gave us lots of playroom with 2 kids. Watched the sunrise from there daily. Close walk to the pool which was amazing in itself. The management group was easily accessible by phone and answered all questions and concerns quickly. Loved the fruit basket as well. The unit was very clean and well furnished. the proximity to the water's edge was spectacular. There were a number of close by restaurants. This condo looked fabulous in the photos and exceeded our expectations in reality. 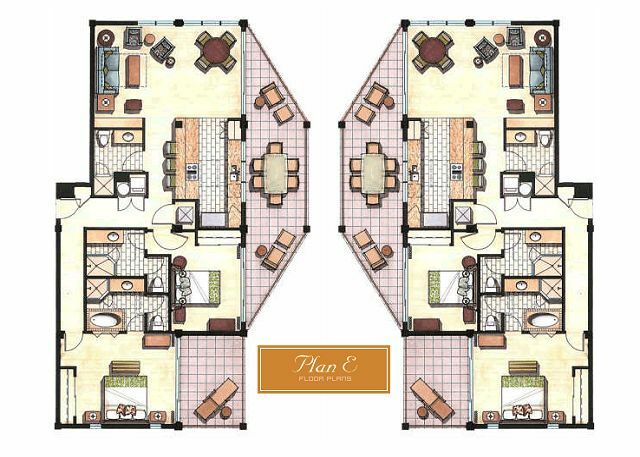 The unit is everything you'd want in a vacation condo and the resort offers everything you'd need. 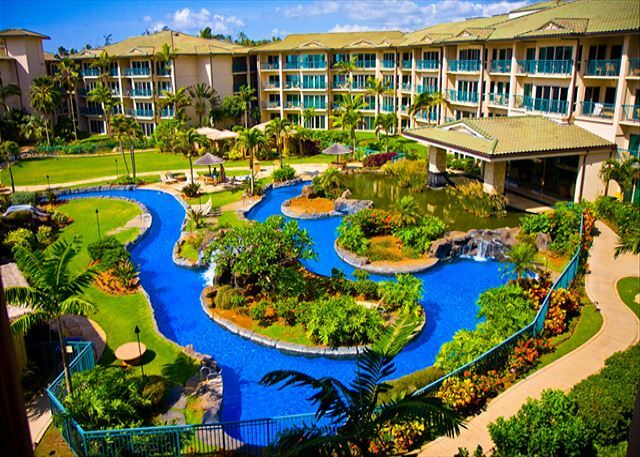 Beautiful grounds, fantastic restaurant, great fitness center, fun lazy river pool with slides. The staff are friendly and efficient. The resort is surprisingly quiet for such a large facility. We were lucky enough to have monk seal K30 join us on the beach just outside our condo every day we were there. 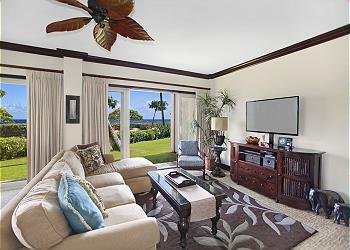 The resort is centrally located between the Princeville/Hanalei area and the Lihue/Koloa/Poipu areas so it's an easy drive to see most of what the Garden Island has to offer. Longer day trips to Waimea and Kokee are well worth it, too. Lots of activities to enjoy from experiencing Spouting Horn to kayaking the NaPali Coast. Lots of art shows on the weekends, slack key music in Hanalei on Sundays, diverse ethnic restaurants to try all over the island. A vacation in this condo and resort can be as relaxing or as stimulating as you want. We plan to stay here again and again. The staff at Kauai Exclusive Management were easy to work with, accommodating and helpful in making this dream vacation come true. Great location and condo, but proximity to construction next door (almost finished) was a negative as was constant flow of landscapers working way too early outside with machinery every morning. Had to keep doors closed most every morning. Issues with garbage disposal not working and freezer door on subzero fridge was virtually impossible to get open. Needed two hands and wife could not do it. Ice machine in freezer also did not work. As for resort, restaurant staff made it impossible to relax by pool. The kitchen is detached from restaurant and staff are constantly coming by pool area with carts and dishes. Worst was a cook in kitchen constantly singing at the top of his lungs - horrendous! Nowhere near pool could you avoid his screeching. Even after called in complaints to restaurant, he continued....drove us away from pool every day. Also, the restaurant staff take smoking breaks so close to A107 all (day and night) that cigarette smoke is smelled often in condo... Overall would recommend Waipouli (especially with kids) and Kauai Exclusive (very nice and responsive staff! ), but they need to work on the above issues for A107 and the resort, in general. Someone especially needs to talk to the restaurant management about the loud and incessantly smoking employees near the otherwise beautiful building A and pool. Very happy with Property. Room very clean and well appointed. Location of room only a few steps from Beach.Kitchen well stocked with dishware and condiments. Lanai has padded lounge chairs which is rare on this property. Motel like property next door was being worked on, some construction noise. Pool very good but Pool Guard was to strict on the Pool Rules. Room gets 5 stars property gets 4 stars. The condo is a suite. Roomy, comfortable and the location is outstanding. 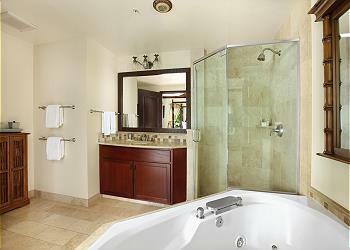 You are close to the airport, shopping and restaurants.The beds are comfortable, bathrooms have jacuzzi tubs. There are three full bathrooms in this condo.The pool is fantastic. The sound of the ocean is so relaxing. Very few people come to this end of the resort, so it is quite private. A wonderful place to stay. It was very easy to make reservation through Kauai Exclusives. Patrick and Sean were very responsive to my inquiries. They call right away and respond to emails immediately. Unit A107 is beautifully decorated. The interior decorations are top notch. The kitchen is well stocked, complete with upgraded appliances and utensils. They have everything you'll need and more. The unit is also very spacious. The bathrooms are all beautiful and clean. I can say this is the best unit we've ever stayed in. Thank you. love this suite! we will certainly be back! We had an absolutely amazing time staying in Unit A107 at Waipolui Beach Resort. What a gorgeous unit, with a perfect, ground floor location. The numerous sliding glass doors open onto a beautiful lawn, separated from the beach by a hedge, making it perfect for us with our one year old twins. The property is gorgeous, and the pool perfect for kids. 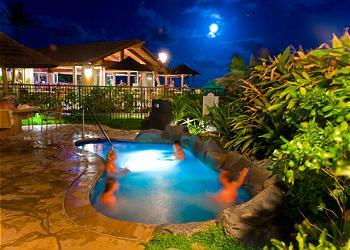 There are numerous hot tubs, two for adults only if you want to get away from the kids. A baby/small child, sandy beach/shallow pool area that was so great with our babies. Additionally, the resort's location in Kapa'a was very centrally located, being right about in between the north and south ends of the island. We found it quite easy to travel all over the island from there. If you are thinking of staying at Waipouli Beach Resort, I would put A107 on the top of your list; it truly is the best location in the whole resort. We had a great time. We rented A107 and the suite next to it, A106. Both were nice and had a lot of random items that came in handy such as beach chairs, noodles, cooking supplies etc. The views are great from both rooms and the resort pool is fantastic. Overall the rooms were maintained pretty well and everything worked with the exception of the freezer doors, which took 2 body builders and a horse to pull open, but eventually worked as well. A107 could use some fresh pain on some of the walls since they were scuffed up a bit, and they seem to be redoing some of the stucco outside around the entire resort due to salt water erosion. Parking was easy and close to our rooms. a solid 4 stars. Perfect Bride and Groom suite! We may be biased because we also had our fantastic beach wedding ceremony and reception at Oasis. But we aboslutely loved the Waipouli Beach Resort! In particular, Unit A107 is a true gem. Closest unit to the water. At the same time is the most private unit, as it has a side lanai that is closed off from the general public by landscaping. We utilized the suite as our staging area for our wedding and it suited our needs perfectly. The wedding party procession was able to walk from A107 directly down to our beach ceremony. The only complaint we have is that on the first day the A/C was not working at all, no matter how much we verified all doors were closed. However, Josh the property manager was over to help in a matter of minutes! Prompt and professional service! A/C issue was resolved by maintenance within a couple hours and worked flawlessly througout the week after. The unit itself has all the imaginable amentities and TVs in every room. Perfect kitchen with the most high-tech appliance I've ever used. We stocked up at Costco and cooked every day and why wouldn't you with that fantastic view! We had friends and family staying in about 10 other Waipouli Beach Resort units and they would all highly recommend A107 as the best! Beautiful property, very well maintained and the folks that manage it give personal attention. You will not be disappointed with this location. Love being close to everything in town, but especially to the beach. You really can't get much closer to one of the nicest beaches on the island. The place was very nice, clean and staff was available and responsive. It was great for the kids because we could open the sliding glass doors and spill out on to the lawn and then the beach or pool. The view was amazing, the grounds were clean. The only negatives: it was not 1800 sq ft as advertised; one morning we found an open 6-pack of beer at our outdoor dining table that did not belong to us meaning some stranger was out there drinking at night; one group of rowdy singles at the hotel screaming and cursing (only once during our stay and management did eventually ask them to leave, although they could have done it sooner). Still, overall was a very good experience. Great experience would recommend to anyone. Centrally located on the island makes nice to tour the entire island. 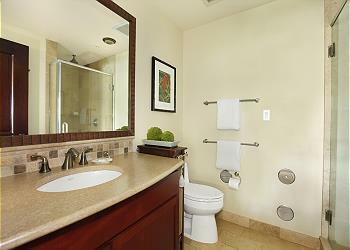 Rental is equipped with all items needed for a great stay. The property is well maintained. 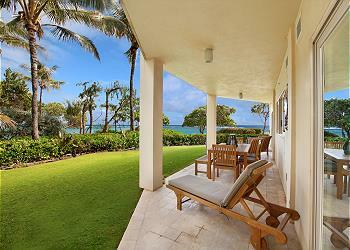 We would definitely stay at Waipouli Resort on a future Kauai vacation. The overall quality of the unit is truly superior to most other condos we have rented. 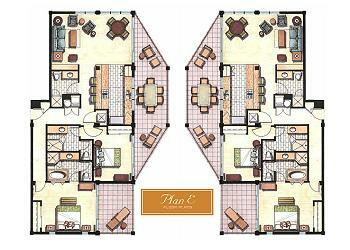 The layout of the condo is excellent, providing nice amenities and adequate privacy. The views are spectacular! The kitchen set up was like being at home, with good quality utensils, etc. Some caveats: the dishwasher did not do a good job of cleaning. Soap residue on plates and glasses. We had to contact management about a stuck closet door. It was fixed promptly and efficiently. We told Josh about stucco peeling off the lanai walls. He told us about a law suit pending to fix it. It is unsightly. Work next door (asbestos removal, we believe) was a distraction with loud music and banging away. Resort amenities were superior with a fully equipped fitness center. We really liked the ambiance of the resort compared to say the Marriott with its huge setting, Very nice layout. We did have a generally mediocre over-priced meal at the Oasis. This was a disappointment. These items did not detract from an overall sense that KEM is doing a good job. A big wahola to Patrick and Josh. Aloha until we meet again. Great family vacation. Loved the layout and loved being on first floor with great lawn, steps to beach. Perfect location on island. Would high recommend!!!! A wonderful place to experience heaven on earth! Out experience was exceptional. The resort is amazing. It has all the amenities that you could want, it is centrally located, has a great pool area, the resort staff are very helpful, and the sunrise views amazing. Unit A107 is truly the best with oceans views from every room, comfortable furnishings and every amenity you could want. 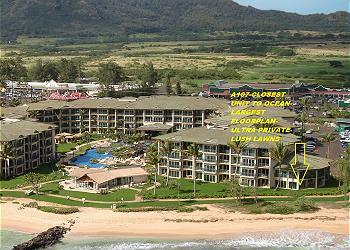 Kauai Exclusive Management also does and outstanding job from reservations to check-out. Great island, great place to stay. We had a wonderful week in Kapa'a in the Waipoulii Beach Resort. Josh was particularly helpful. WOW! Great spot right on the ocean. Awesome spot to rest and relax. We were confused by the fact the freezer was unavailable for use. Also, hood fan lights were not working. The entire experience was amazing. These guys have great customer service and the property was immaculate. We will be back. We came all the way from Switzerland and lets just say it was worth it. NO complaints at all. When asked for a late checkout, they said no one is checking in that day, so sure! my friend paid 200 dollars at a other agency. It was fantastic. Would go back and use this company next time we need to rent on Kauai and at this resort!!!!! They loved us and decide that we are #1!! OOPS wrong number to use.. Trying to resolve this with Trip advisor! We live locally in Kapaa but love to escape to the beautiful Waipouli Resort. We were very happy with the entire experience. The suite/view were amazing. We enjoyed our stay very much. Thank you to Joshua Rudinoff for the excellent service! This condo is perfect both in terms of space and view. The Master and Guest bedrooms both have king beds. The sleeper sofa is a king. There are three full bathrooms. We were five adults and never felt like we were "on top of each other." The view from this condo is phenomenal! The entire kitchen and living areas have a full ocean view. The lanai is huge; it wraps around the condo. The patio furniture is extremely nice, and there are ample pieces. 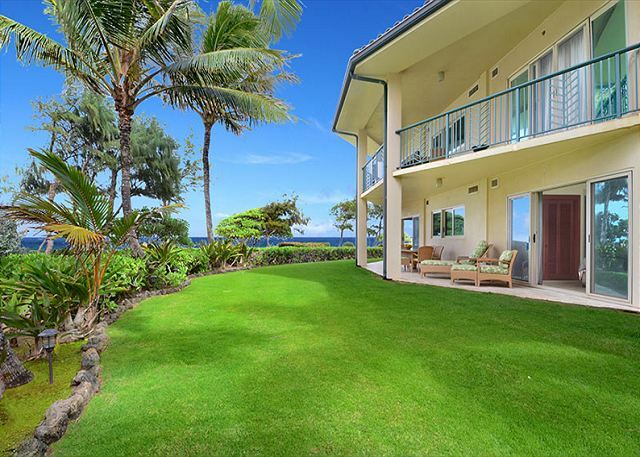 There is a wonderful grassy yard in front of the lani that is private to the condo. The kitchen was well stocked with dishes, pots, and pans, and the bathrooms had plenty of towels. I would stay here again in a heartbeat. 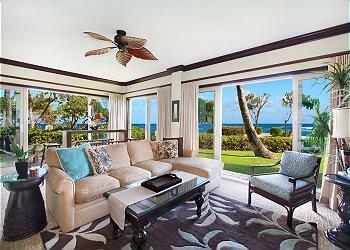 Truly, this condo allowed a fabulous stay with a glorious view of paradise! - the light from the parking lot was a bit annoying as it streamed in at night through the windows beside the bed in the master bedroom. Either blackout shades or better coverage is needed. - there were plenty of lids but very few containers for storing leftovers in the fridge. Perhaps some of those got misplaced in one of the locked cabinets? With a few minor adjustments, this place would be absolutely top-notch. I'm a loyal repeat customer with Kauai Exclusive and love the great service I always get from Josh and team. Can't wait for next year! The things we appreciated most about this property were it's semi-private lawn, view of the sunrise, comfortable furniture...inside & out, and proximity to grocery stores and coast line walking/running path. Wonderful that the sound of the ocean could be heard from both bedrooms. Only improvements would be to repair the dresser drawers in the 2nd bedroom and to provide more washcloths. Beach is good for relaxing but not very "swimable". We had a fantastic time and the view and location was gorgeous and convenient! We will definetly be back! This unit is large, well located and has exceptionally nice appliances. 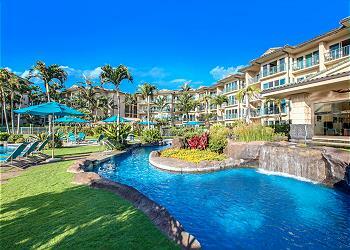 Great location, great pool, great bar, and Josh at Kauai Exclusive was extremely helpful. Would recommend to all of my friends. Rented 5 condos over Christmas and loved all of them. We couldn't be more grateful and happy with the accomodations and the property manager, Josh, who even delivered flashlights and candles to the unit in the middle of a storm when the power went out for a minute! The insite restaurant has a great young chef who is making amazing food too. 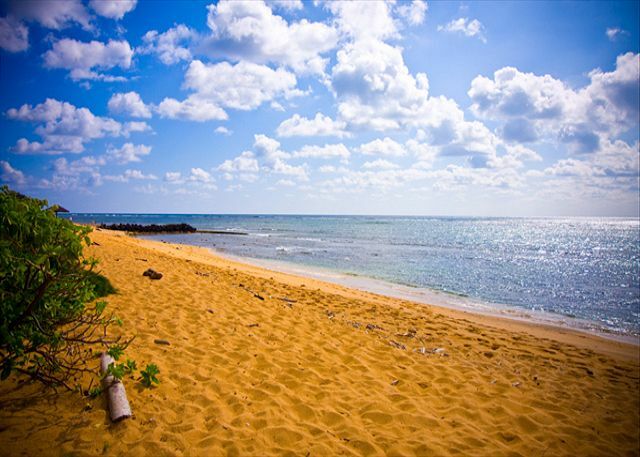 This resort is ideally located mid-way between everything on the island. The management company made sure we were happy with our stay. The condo was beautiful and well appointed. We will definitely recommend it to friends and family. The resort property is exquisite and A107 is everything described and more. I could not have been more pleased with Josh. He answered all our questions and was so helpful. It was a trip we will never forget. A great place to visit, now if i could just live there! Josh assisted with our stay and our experience could not have been better. Both the condo and Josh were just great, highly recommend Kauai Exclusive Mgmt (Josh)and Waipouli Beach Resort. It was everything that was promised and more. Josh and Patrick were a joy to to work with. They are extremely helpful and very professional. Couldn't have asked for a nicer unit in a nicer resort. Unit is large, luxurious and private. Grassy area in front was perfect for our 10-month old to crawl around. We also loved the pool and the convenience of having a Safeway and Starbucks across the road. This place really has it all!! Unforgettable weekend. An experience we will treasure for a lifetime. A must place to stay. The only disappointment we had was our stay was to short, we would have love to stay longer.